Still cannot register as I do not have a zipcode….live in another country. It would be very useful to be able to monitor my account. Yes, unfortunately Retirement Online is not accessible to customers outside of the United States and Canada. This is to safeguard your personal information and keep your account secure. If you need to do business with NYSLRS, you can still email us through our secure contact form, or download forms you may need from our website. I am at a loss to explain why I can manage, online my American bank and other pension accounts all online, but apparently NYS will not let me. It seems to me that your online security must not be good enough and if not for me, it cannot be for everyone else! How long will it take for the site to be available 24 hours and when will all these great new features be available? Privatizing the IT department has been an unmitigated disaster so far. We are releasing Retirement Online in phases. While we are transitioning from our current system to Retirement Online, we are not able to make Retirement Online available 24/7. Over time, we will expand our hours and introduce additional features that will allow you to estimate your projected pension benefit, purchase service credit and more. Some new features will become available in 2018, so please stay tuned. Will we be seeing more features for the Retirement Online account ? It seems that although redesigned, there are less features..
We are releasing Retirement Online in phases. Previous salary information is not available in the current version. We apologize for the inconvenience. Over time, we will introduce additional features that will allow you to check past earnings, estimate your pension benefit, purchase service credit and more. In the meantime, you can see your previous salary information in your Member Annual Statement. This year’s statements are going out to members in batches over the next six weeks. Also, most members can use our Benefit Projector Calculator to estimate their pensions based on information they enter. 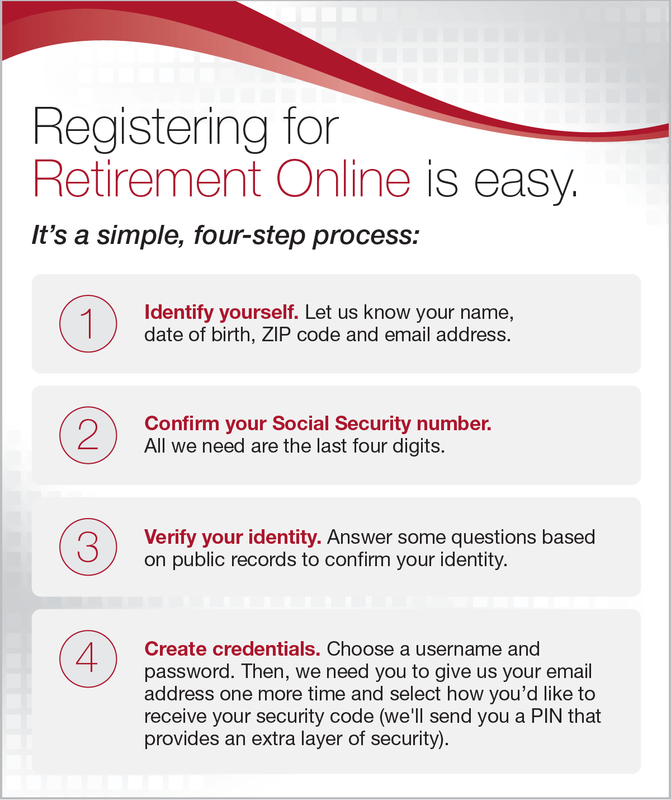 We are releasing the new Retirement Online in phases. Currently, we can’t process retirement applications online. We’re sorry for the inconvenience. We expect to add that ability this fall, along with other improvements and new features. In the meantime, you can download an Application for Service Retirement (RS6037) form from our website.